One of our ace teachers Sophie in her Briar and a knit skirt. I just finished a big project in the last few days, which has lead to my mind wandering around thinking of what to start next. Often at the end of a big slow project I like a quick win as a little pick-me-up to get the engines firing. And I think I am heading to some knit sewing. So I thought I'd share with you why I think sewing with knit fabric is so awesome. I have been involved in crafty circles for a long time and am often talking about sewing/knitting/quilting. And what I hear is that many other crafters say knit fabric makes them nervous as it looks kinda tricky or that they don't have the right equipment (eg. overlocker) to do it properly. To that I say piffle - one of the main things I love about it is it's simplicity. I agree there is a little bit of an art to making it look great rather than super homemade (which is where Sophie's Sewing with Knits class comes in) but I guess I want to show you just what you can do if you take the time (or class) to learn a few basics. In the interests of full disclosure I should say upfront that I have never owned a working overlocker nor do I have a coverstitch machine. And also that my mum was a Knitwit sewing teacher when I was little which is why I don't have the "sewing with knits" fear. It's not because I am naturally fearless. Knit sewing means that you don't have to finish your seams as the fabric doesn't fray. It means that you don't have to hem if you don't want to. I generally also don't bother to pin unless I am working with a curve. All this saves so much time! Based on some of the photo's I have posted on this blog you might be thinking I am a careful seamstress. Knit sewing is where I let it all go. Slapdash is a word that could often be applied to my knit sewing - however the great thing about it is that it is really hard to tell. Kid's winter dress which is super comfy and sparkles. 3. Knit sewing is flexible and forgiving - fudge away people! To state the obvious - because the fabric is stretch then there is more flexibility in the fit. I made my small boy shorts that have fitted him from when he was 3 till now - he is 7. I got four years out of 20 minutes work. The last tee I made for me - when I realised it was a bit big I just took in the sides until I was happy and cut off the excess. Not something you can easily do with woven fabrics. A great example of how forgiving stretch sewing can be would be the last pair of knit kids shorts I made for my little fella to wear to school. I generally make these out of my partners old tshirts and they involve four seams in total - FOUR seams!! One for each leg, one joining the two legs and then the fourth seam is to make the casing for the elastic. I don't even bother to hem them which means that they take 30minutes total to make. And while I can hear you saying "what a laaazy crafter", I would shoot back a "they only last a couple of months before he has put another hole in them therefore hemming seems like overkill".....y'know? Anyway back to my story. Last pair of shorts I accidentally sewed the two legs pieces together in totally the wrong way. Because it was stretch fabric, and it only had a 1cm seam, rather than unpicking I just cut off the seam. And it made no difference at all. These were made when I had my last baby almost 3yrs ago from a free internet pattern. I made up a size 4, used their size 2 and a newborn size. Small people were super chuffed with these....bless. 4. You can make things that fit you in fabrics you really like. I often find that tshirts and tops I buy from the shops stretch out of shape as the quality of the fabric isn't that great, even from good stores. With stores like Tessuti and the Fabric Store in our capital cities, some great local fabric stores, and online shops like Kelani**, all stocking stunning knit fabrics, you can make something you will love in beautiful good quality fabric. And you can make it to fit. In the time it takes to go to the shops to look for the perfect striped tshirt you need, you can have whipped one up. **Elissa has got the most gorgeous organic knit fabric in at the moment!! Top pattern by Megan Nielsen. Sewn by Sophie. 5. Once you have the basics there is nothing to it. It is simple sewing at it's best. The kind for when you need a quick win or you only have an hour or your girl child desperately needs a new skirt by tomorrow in red for her special day at school. There are great patterns for women. These are just a small sample. And for kids have a look at these. ***while you are there have a look at their other patterns. I love their new Suzy Pant - such a great shape. I really want you to get how easy this type of sewing is. So I've come up with an idea - as I have a science degree I thought we could do a little experiment. I have an hour or two on Monday so I thought I would make the Grainline Hemlock tee in a piece of gorgeous Tessuti stretch cotton and give you "live" photo updates on instagram and facebook as I did it. Just so you could see how quick it is to whip up your own knit garments. I've already mentioned it in the post but just in case you didn't hear the shameless plug I thought I would let you know that there is still some space in Sophie's Sewing with Knits class. If you fancy coming to a weekend crafting retreat that is. At the end of the class you would be able to tackle ANY of the patterns I mention above with confidence and come out with a great looking garment. Yeah Sophie! Any other suggestions for patterns or fabric resources? I used EZ's EPS to get the numbers for this little jumper. Pattern was originally Ysolda's Coraline for women. "Really all you need to become a good knitter are wool, needles, hands and slightly below-average intelligence. Of course superior intelligence, such as yours and mine, is an advantage." Elizabeth Zimmermann, Knitting without Tears 1971. So I need to state upfront that I have the love for this woman. Love her. Love her writing, love her attitude and love the way she taught. She had the joy! 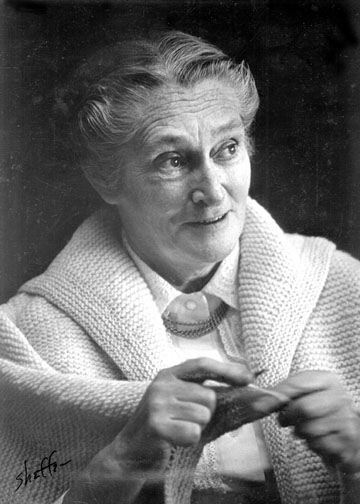 For those of you that have never heard of Elizabeth Zimmermann she was a knitting pioneer. * Her first book was Knitting without Tears was published in the early 1970s but well before that she was influencing a generation of knitters with her wisdom and ideas through the newsletters she published from Schoolhouse Press, her company. She wrote four books - all of which are still in print. I haven't included a picture of her as I didn't want to lift one without permission (and I wrote this late last night) but here is a link if you want to have a look. Or check out SchoolhousePress here. Godmother to seamless knitting, she came up with a system of percentages for making a jumper or cardy called the Elizabeth Percentage System (EPS). (This system revolutionised my knitting! I use it all the time.) Elizabeth used the term unventing about many of the things she came up with as she believed that someone at some stage would have done them somewhere so she couldn't invent them. She made knitting accessible to all, by encouraging others and her belief that there was no right way and that it really wasn't that difficult. I thought I would share some life lessons from her books to see if you will catch the EZ bug. 1. "Knit on in confidence and hope through all crises"
Look even if you aren't a knitter, how could you not love this quote. Confidence and hope are really all you need - this is absolutely a lesson for life. I think of her often when I have one kid crying because she doesn't like broccoli, another kid crying because he didn't want curry for dinner and the third one in a state of absolute devastation because she wanted a blue bowl, not a white one. Equally though I think her words apply to most crappy things that occur in life. Again a total lesson for life. Holding on too tightly = bad. Practice not doing it. Got it! My first proper attempt at the EPS - I made up all the numbers. I was so chuffed with myself. The kid in the photo is now nearly 6 and the jumper is still going. 3. It's your knitting. "There is no right way to knit; there is no wrong way to knit." Being the fan that I am I have all of her books and have just sat here for half an hour trying to find which book has the quote "It's your knitting" in it. Frustratingly I can't find it but thinking about it, it doesn't really matter. All through every one of her books she is encouraging you to own your own project. She says that no book has all the answers. That the answer will be different depending on your circumstances. "Fudging: This is permitted, yea, even encouraged and necessary in knitting" Knitting Around. As someone who likes to get things "right" I read this at the very beginning of my crafting life and gee it was freeing. My little brain for some reason needed to hear it in order to go "aaaahhh right. I get to decide". And fudge I do. All the time. Crafting is good for the soul. But only if you do it properly without pressure. She goes in to her "theories on knitting" later in the book. Don't know about you but I love a theory. For this one I used the EPS as a jump off point. I think it needs some refinement. 5. "If you hate to knit, why, bless you, don't; follow your secret heart and take up something else." Be who you are and do what you love. Wisdom and more wisdom. And one more thing. She is funny; laugh out loud funny. Do yourself a favour and go check out one of her books. Any other quotes you love of Elizabeth's? And if you have never heard of her, did I spark your interest? If you want some help with improving your knitting we have some great workshops. Intro to Seamless, Intro to design, Finishing and Fixing and Beyond Beginners. 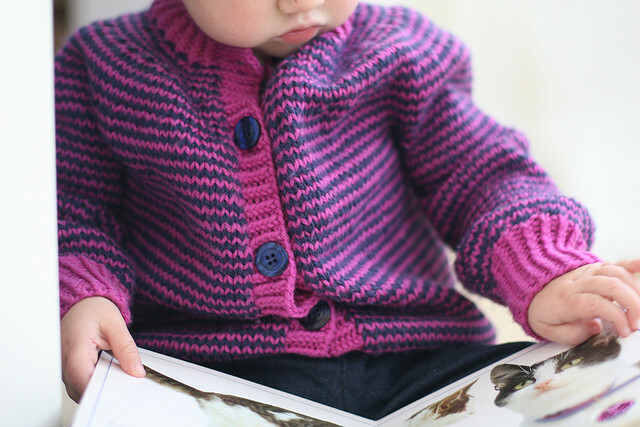 If you are beginning and think you might like to have a look at her books buy Knitting Without Tears. She teaches knitting in a way that means that you actually get the structure. Getting the structure means that you are free! She lived a super interesting life and if you are interested in reading about that life then the book for you is Knitting Around 1989. * She was also an Englishwoman who was married to a German fella, lived in the US, had a three kids and then some grandkids. She ran a business called Schoolhouse Press that is still run by her daughter Meg Swansen. She died in 1999. Read more on her wikipedia page.